Leatherneck Honors Society Riflemen above with the USS Constitution Color Guard below on the ship at the commemorative service at the Charlestown Navy Yard on Dec. 7, 2016. Thursday is the 76th anniversary of the surprise attack on Pearl Harbor that killed more than 2,000 American soldiers and sailors. Across the country, people will honor those who lost their lives at the Pearl Harbor naval base near Honolulu, Hawaii. President Trump is expected to sign a proclamation this afternoon for National Pearl Harbor Remembrance Day. ■ 12:30 p.m.: The National Parks of Boston will host its annual commemoration ceremony at the Charlestown Navy Yard with the crew of the USS Constitution and staff of the USS Constitution Museum. 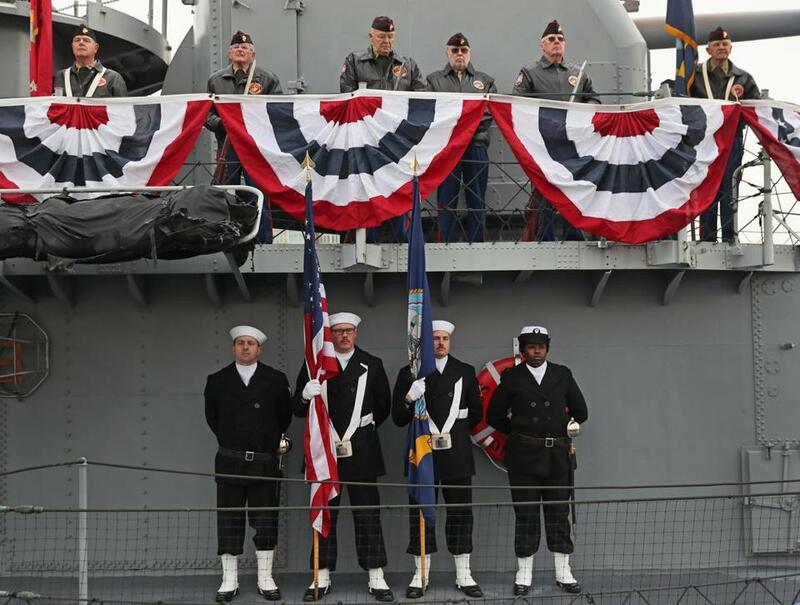 The ceremony will be held at the end of Pier One and on board the USS Cassin Young. The event is free and open to the public. ■ 6:30 p.m.: A program at the Old South Meeting House will explore the definition of an American. Hosted in part by the Chinese Historical Society of New England and a variety of other community partners, the evening will include a partial screening of the documentary “The Chinese Exclusion Act”; the reading of an excerpt from “Hold These Truths”; remarks from Paul Watanabe, director of the Institute for Asian American Studies; and a panel discussion. Tickets are free, but can be secured in advance here.